Arches near the Roman theatre. Fiesole (Italian pronunciation: ) is a town and comune of the province of Florence in the Italian region of Tuscany, on a scenic height above Florence, 8 kilometres (5 mi) northeast of that city. According to the 2003 census, its population was 14,100. Florence as seen from Fiesole. Fiesole (Etruscan Viesul, Viśl, Vipsul) was probably founded in the 9th-8th century BC, as it was an important member of the Etruscan confederacy, as may be seen from the remains of its ancient walls. The first recorded mention on the town dates to 283 BC, when the town, then known as Faesulae, was conquered by the Romans. In pagan antiquity it was the seat of a famous school of augurs, and every year twelve young men were sent thither from Rome to study the art of divination. Sulla colonized it with veterans, who afterwards, under the leadership of Gaius Mallius, supported the cause of Catilina. Fiesole was the scene of Stilicho's great victory over the Germanic hordes of the Vandals and Suebi under Radagaisus in 406. During the Gothic War (536-53) the town was several times besieged. In 539 Justinus, the Byzantine general, captured it and razed its fortifications. 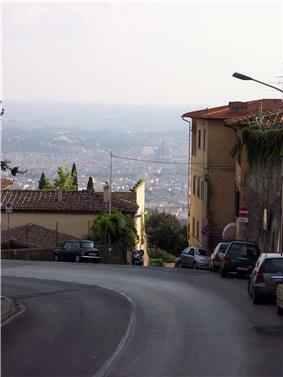 It was an independent town for several centuries in the early Middle Ages, no less powerful than Florence in the valley below, and many wars arose between them; in 1010 and 1025 Fiesole was sacked by the Florentines, before it was conquered by Florence in 1125, and its leading families obliged to take up their residence in Florence. Dante reflects this rivalry in his Divine Comedy by referring to "the beasts of Fiesole." (Inferno XV.73). 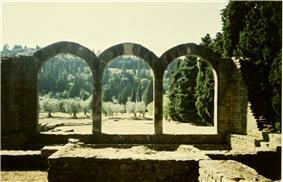 By the 14th century, rich Florentines had countryside villas in Fiesole, and one of them is the setting of the frame narrative of the Decameron. Boccaccio's poem Il Ninfale fiesolano is a mythological account of the origins of the community. 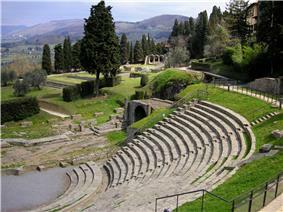 Robert Browning mentions “sober pleasant Fiesole” several times in his poem "Andrea Del Sarto". Palazzo Comunale (Town Hall) of the 14th century. The cathedral of Fiesole (Il Duomo), containing the shrine of St. Romulus, martyr, according to legend the first Bishop of Fiesole, and that of his martyred companions, also the shrine of St. Donatus of Fiesole. The Badia or ancient cathedral of St. Romulus, built in 1028 by Bishop Jacopo Bavaro with materials taken from several older edifices, at the foot of the hill on which Fiesole stands, supposed to cover the site of the martyrdom of St. Romulus; it contains notable sculptures by Mino da Fiesole. The old cathedral became a Benedictine abbey, which passed into the hands of the Canons Regular of the Lateran. It once possessed a valuable library, long since dispersed. The abbey was closed in 1778. The room in the bishop's palace where Carmelite bishop St. Andrew Corsini lived and died. The little church of the Primerana in the cathedral square, where the same saint was warned by Our Lady of his approaching death. Built in 996 and further expanded in medieval times, has maintained the Gothic presbytery from that period. It received a new façade in the late 16th century, with graffito decoration by Ludovico Buti. The interior, on a single hall, has a 13th-century panel portraying Madonna with Child. In the transept are two marble bas-reliefs by Francesco da Sangallo, and a terracotta from Andrea della Robbia's workshop. The church of S. Alessandro, with the shrine of St. Alexander, bishop and martyr. The monastery of S. Francesco on the crest of the hill, with the cells of St. Bernardine of Siena and seven Franciscan Beati. 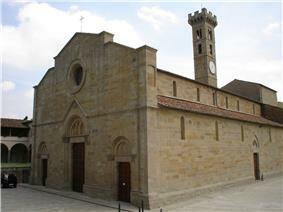 San Girolamo, the home of Venerable Carlo dei Conti Guidi, founder of the Hieronymites of Fiesole (1360). San Domenico, the novice-home of Fra Angelico and of St. Antoninus of Florence. Fontanelle, a villa near S. Domenico, where St. Aloysius came to live in the hot summer months, when a page at the court of Grand Duke Francesco de' Medici. Fonte Lucente, where a miraculous crucifix is greatly revered. 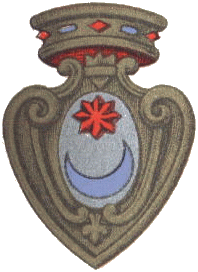 S. Martino di Mensola, with the body of St. Andrew, an Irish saint, still incorrupt. the greatest name associated with the city is that of Fra Angelico or Blessed Giovanni Angelico, called da Fiesole (1387–1455). His baptismal name was Guido, but entering the convent of the Reformed Dominicans at Fiesole, he took Giovanni as name in religion; the surname Angelico 'angelic' was afterwards given to him in allusion to the beauty of his works and purity of spirit. St. Andrew Corsini, a Florentine Carmelite friar(1302 – January 6, 1373), Bishop of Fiesole. Andrea Barzagli, soccer player, member of the 2006 Italian World Cup champion team. Gertrude Stein and Alice B. Toklas spent their summers in Fiesole before the First World War. Gabriele Corcos, chef, restaurateur, Cooking Channel star of "Extra Virgin"
Debi Mazar, actress, Cooking Channel star of "Extra Virgin"
^ Gaius Mallius was a colonist of Fiesole who, according to Sallust (Bellum Catilinae 24.2), was the first to raise an army and take the field against Rome. His nomen is often confused with the more common Manlius. ^ Radagaisus was executed 23 August 406 (Herwig Wolfram, Thomas J. Dunlap, tr., History of the Goths, 1988:169); Paulinus of Nola attributed the victory of Stilicho over Radagaisus's Ostrogoths near Fiesole, to the protection of Felix, Peter, Paul and other saints. ^ Nocita, Teresa. "Giovanni Boccaccio: Tuscan mythologies". In Italo Pantani. Pathways through Literature. Internet Culturale. Retrieved 2012-01-12.